Every journey to another country is something I cherish. Each day in a new place brings greater perspective on the location itself and on my relationship to it. Admittedly, my first knowledge of Aruba comes from the 1988 classic Beach Boys tune, “Kokomo.” It’s the first lyric of the song which follows with a list of other Caribbean islands. Oddly, Kokomo doesn’t exist. Unless they meant Kokomo, Indiana, but if so, I hardly imagine it to be the romantic destination he hopes for. On my flight, I spent every moment with my neck craned to the right looking for islands. The flight path took me over the dramatic shape of Salt Cay, pointing to the southwest. As we continued over the Dominican Republic, I marveled at the topography and the beauty of the Rio Ocoa delta. Landing in Aruba gave me a lesson in the trade winds as well. Most of the year, Aruba has sustained winds that average 12-19 knots depending on time of year. Our landing was a crosswind masterpiece by the pilots. My first night was spent walking the beach and observing the local flora and fauna before enjoying a beautiful sunset. I learned that “Bon dia” is the greeting for hello in Papiamento – it’s one of Aruba’s official languages along with Dutch. My taxi driver was very friendly and spoke fondly of his home island (with some tips about the best local places to eat.) Most Arubans speak at least four languages​​, including English, Spanish and Portuguese. Hotel guests enjoying the warm waters just after sunset. 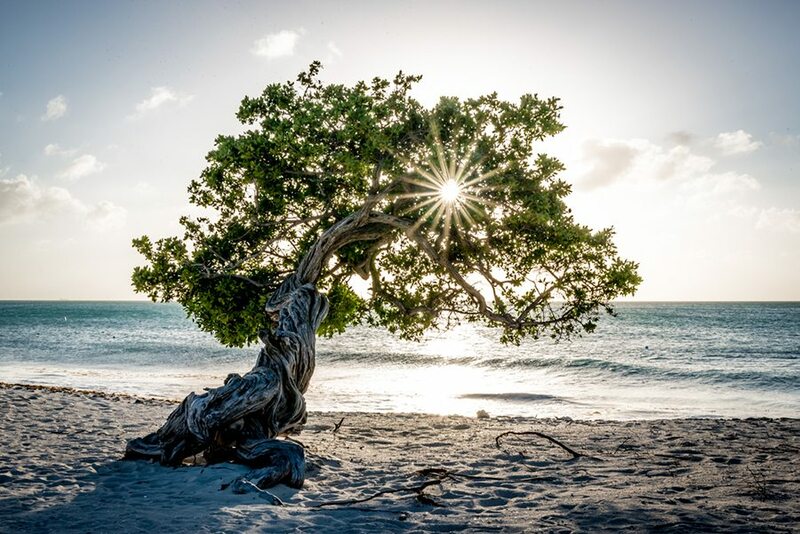 I wanted to make a point to visit Eagle Beach where iconic Divi Divi (watapana) trees stand as Aruba’s natural compass, always pointing in a southwesterly direction due to the trade winds that blow across the island from the north-east. It truly is a friendly island as their tourism slogan “One Happy Island” suggests.